Now please don't do what I did and google the word Zomp, if you do a search, do an image search, because after what I found in a text search I had to scrub my eyeballs and wash my computer out with soap! However despite that, Zomp is apparently a beautiful blue green colour, somewhere between jade green and turquoise, reminiscent of the colours in a peacock's tail. So Mrs A would like to see a card with more than one fold, OR a card using this lovely colour, OR (for extra brownie points and a chance of a bonus prize) BOTH. And of course there must a butterfly on it somewhere. Here's my card, a zig zag fold that uses rather a lot of Zomp as well. The panels are covered in card from a lovely Hunkydory kit and the extra butterflies die cut from snippets using a Dovecraft layering butterfly die set. 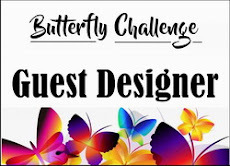 Now I'd love to see what you can make for the challenge - I'm looking forward to visiting you all when you link up to The Butterfly Challenge - see you there! Post script - I see Mrs A has changed the name of the colour to Blue/Green now - it's the same colour though and I'm leaving the chatter about zomp in my post to give you a giggle! A beautiful card Jane, so glad you googled Zomp for us, I'd never heard of it before. Great card and a great design. A beautiful card Jane, pretty colours and fabulous design. This is just gorgeous, so pretty. I'll take your advice and won't google zomp! Thankyou Jane for being my Guest Designer for this challenge. I'm afraid I rather chickened out after you emailed me with your findings on the colour word. I just couldn't face having to wash my computer out with soap. I'd never get it working again and I have enough troubles with it as it is!! So Peacock blue/green it is. I love this card you have created BTW. hugs Mrs A.